Yes, it’s true, serving others without focusing on yourself has become part and parcel of your role as a woman, particularly if you are a mother. But have you ever realized you need some “me time” to remain the rudder that keeps your family boat afloat. Mother's Day has just passed, and I take the opportunity to encourage mothers, both young and old, to practice self care and commit to taking better care of themselves to make this world a better place. I believe that, as a mom, you are the root of your family, which must be nurtured, pampered, and caressed to help your loved ones benefit directly from your health, liveliness, and fulfillment. So why ignore your health when a healthier you can do much more for your family? Remember, self care for mom does not make you selfish; rather, it is imperative to stay sane, be physically healthy, and be the kind of mother you have always wanted to be! According to a recent survey conducted by salary.com, a part-time mom should get paid $65,698 for all the work she does for her family, putting 58 hours a week in the service of her kids. Stay-at-home moms in the survey work for about 95 hours a week, which makes it all the more important for them to take care of themselves. But a 2011 survey revealed that 80 percent of mothers do not spend quality time on self-care, believing it selfish enough to carve out time for themselves. However, I believe self care is non-negotiable but necessary to be the best parent possible. · Spend a special night once a month or week dating your husband. Take out some time with your husband to add romance to your married life. · Schedule a day to spend some valuable time with the kids to have fun. Find creative ways to do a workout while the kids play in the park. Plan concerts or other fun-filled activities in advance to force yourself to come out of the house. · Find out what is preventing you from taking time out for yourself and just blast the barriers. Most of my clients often complain of experiencing feelings of guilt, lack of support from family, and inadequate time and finances. Take some time to draw up a plan to overcome these roadblocks for a healthier you. Remember, moms that understand the value of paying attention to their own needs know how it makes them more attractive, happier, and self confident, giving them every reason to smile and benefit their families. · Identify your strengths and weaknesses and constantly remind yourself that you are no Superwoman. The superwoman syndrome may keep overpowering you to ignore yourself in order to be the perfect mom for your kids. Ditching the super mom syndrome is indispensable to relieving the unnecessary stress and expectations yon have attached to yourself. · Let go off your mental barriers; learn to say No and do not curse yourself for imperfection, since what you are doing for your family is worthy of applause in every way. 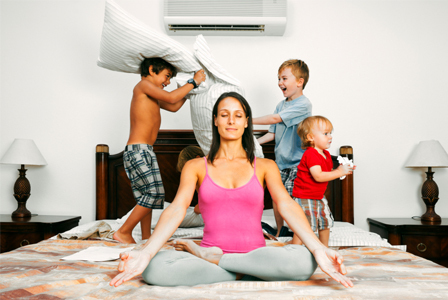 As a mother, stop burdening yourself under the weight of unnecessary expectations. Start to love yourself and be a more realistic, yet happier mother for your kids. · Stick to a daily routine. Read inspirational and motivational books, such as Time for Mom-Me: 5 Essential Strategies for a Mother’s Self Care, to acquaint yourself with strategies for finding personal time while learning to balance the rigors of parenting. · Dream big. Be the person you have always been. No doubt motherhood is challenging, but it is equally rewarding. Allow yourself to dream. You deserve a life beyond motherhood. Work toward fulfilling your dreams that you have been postponing since becoming a mom and see how the change gives boost to your ability to thrive in motherhood. A personally fulfilled woman, who has achieved a balance between personal and professional success, makes an amazing mom. · Negative perception has not done any good, and it would do you no good either. Consciously take steps to change your thoughts. It is important to think positive and learn to self respect. Never think you are being selfish in taking some time out for self care; rather, take an opportunity to thank yourself for all the big and small things you have been consistently doing for your family. Learn to love, honor, and forgive yourself. · Spend a few minutes to find out how you can restore the balance in your life. Find out who else in the family can help you with some daily chores. There are plenty of household chores to be done daily but that does not mean you are the only one to finish them off. Nurturing yourself would make you stronger, energetic, and full of liveliness, reducing the stress and strain of your routine life while improving your mental and physical health. Taking time out for yourself and doing things that improve your health would make you stronger from within, boosting your spirit and giving you extra energy to complete the family tasks you commit yourself to daily.